Lacking apps. 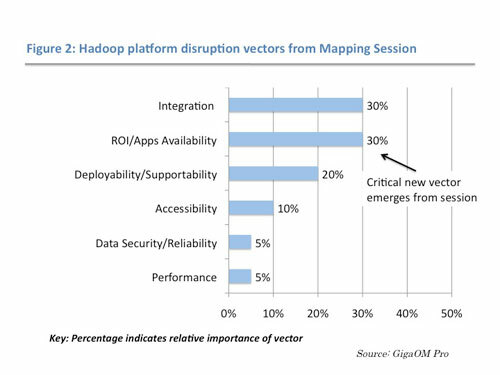 Participants identified a potentially powerful market force that prior GigaOM Pro analysis had perhaps underplayed: the availability of applications for Hadoop that would convince senior business and IT executives of the platform’s ROI. Integration. Participants reaffirmed that integration was the other most important market trend in the sector. Early leaders. Participants rated Cloudera and MapR as somewhat better positioned to ride the trends — especially integration — than IBM or HortonWorks. None of the four companies has any current advantage in applications availability, so that is a huge opportunity. 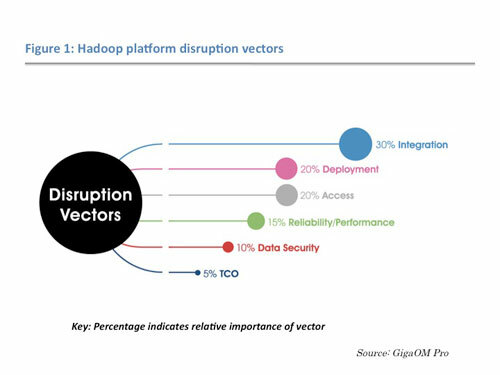 Figure 1 illustrates our GigaOM Pro analysis of what we call the Hadoop platform market disruption vectors — that is, the six competitive areas in which companies can drive or leverage market share gains and revenue growth. Mapping Session attendees confirmed our analysis that integration with existing databases, data warehouses, and business analytics and business visualization will be the most important vector for Hadoop platform suppliers. Data analysis and business intelligence won’t be useful if it is locked away in a Hadoop silo separate from existing processes and data running on legacy IT infrastructure. Successful Hadoop platforms will provide connectors that bring Hadoop data into traditional data warehouses as well as pull existing data out of a data warehouse into a Hadoop cluster for analysis. In the near term, those platforms available as appliances that integrate Apache code with servers and storage have a distinct advantage in deployment. Likewise, companies that build SQL interfaces to Hadoop will gain ground in access if their rivals fail to produce familiar business-analysis user interfaces or rely on IT departments to code directly to MapReduce or in Pig. We don’t think code optimization for reliability and performance, tools or services in support of traditional data security and compliance, or especially total cost of ownership are nearly as critical for differentiation as the other vectors. At least not until the market matures a bit. We presented our disruption vector analysis during the Mapping Session, and the room’s consensus was that integration remained the most powerful market force. But while discussing external forces and the costs of Hadoop implementation, we identified a parallel, equally important vector. Participants decried the industry’s focus on infrastructure optimization and cost minimization at the expense of proving business value. Overall ROI should trump total cost of ownership, ran the argument, but it’s difficult to prove Hadoop platform ROI right now. That’s partly due to a dearth of packaged applications aimed at specific business functions, which, in turn, is because transactional apps are largely easier to package than analytics apps. Think about the early days of relational database deployment in contrast with the apps-driven ERP and CRM wave. The market for Hadoop platforms today is much more like the former. That line of thinking produced a revised set of disruption vectors, as illustrated below in Figure 2. Applications availability will drive ROI analysis by business and IT management, and it will potentially prove the benefits of Hadoop investment over competing technology investments. That is, if such applications emerge. Mapping Session participants rated this as a potential trend for companies to lead or follow to success on par with integration. Our mappers continued to rate deployment as a critical market force, with some added nuance in terms of deployment and support options. As we wrote in our “A near-term outlook for big data” report, “the best Hadoop platforms from a deployment perspective will give customers the choice of running on premise or in the cloud and as software only or in a purpose-built appliance.” Participants agreed that access or accessibility through business intelligence interfaces was a key disruption vector, but it, along with security, was slightly demoted in terms of relative importance against the top three. The participants deemed performance worth its own measure, but we continue to believe security and performance will be differentiators beyond the 24-month horizon. For example, as big data analysis becomes more oriented to real-time decision making, the batch-oriented Hadoop will face competitive threats from alternative technologies. That will increase the importance of performance as a competitive disruption vector. The next step in the Mapping Session process was to identify and analyze a handful of Hadoop platform suppliers for their strategic and tactical alignment with the disruption vectors. Participants scored the companies on a 1 to 5 scale of relative competitiveness for each vector, and when we applied the vector importance weighting, the results produce the chart below in Figure 3. The distance from the center indicates each company’s relative position versus the others. A high score in a less critical vector is less important than an average score in the most critical ones. 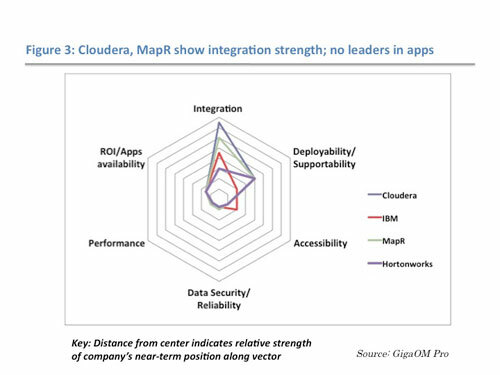 Mapping Session participants rated Cloudera and MapR as better positioned to take advantage of market forces in the near term than IBM or Hortonworks. Both companies did better than average on integration, partly due to OEM deals with Oracle (Cloudera) and EMC (MapR). IBM professional services seem to focus on integrating its Hadoop offering with its own installed technologies, according to panelists. On the other hand, IBM got relatively high marks for accessibility, as its BigSheets data analytics package is something of “an Excel for Hadoop.” Hortonworks’ best score came from its deployability, which matched that of Cloudera’s and MapR’s in the eyes of the participants. All the companies received equally low marks from the mappers in the other key disruption vector of applications availability. But panelists were optimistic that the landscape could change dramatically in a short time. Eight months from now, a few critical third-party apps focused on industries like heath care or functions like internal search could completely rewrite the Hadoop platform script. That’s why the GigaOM Pro analysis of the Hadoop platform market is a process. We welcome your input and feedback. Continue the discussion by leaving a comment below. Also, note that this Mapping Session is an input to GigaOM Pro’s research process. Look for a Sector RoadMap report on Hadoop platforms that will crystallize our take on the market in the near future. If the on-demand music streamer Spotify is worth $3 to $4 billion, why is MOG, a similar if much smaller service, reportedly being sold for $14 million? The digital music industry is in flux, but it’s showing positive signs of growth. Are those two players really so different? Our recent GigaOM Pro digital music forecast described Disruption Vectors, market forces and trends that smart companies can use to gain revenue and market share in the near term. Our analysis rated Spotify as the company best positioned along several of the most important vectors: anywhere access, discovery and the highly disruptive rent vs. buy business model. But MOG scored well on those factors, too. Would-be investors must think that Spotify can pull off a network effect based on its size and momentum, and on its efforts to establish itself as a technology platform for developers. Indeed, Spotify claims to have 10 million active users in comparison with MOG’s 500,000. But Spotify’s business model isn’t solidly established. Its contracts with rights holders will come up for renewal at some point, and there’s no telling what the labels well demand this time around. Rumor has it that the labels got upfront guaranteed payments. What more could they ask if Spotify raises even more money? The big labels already have equity positions in the company. Meanwhile, Spotify’s platform strategy is smart, but limited. It is using APIs to attract apps that run within its own application. Recently, it has used this strategy to tap into another Disruption Vector: the changing role of record labels. Several labels, including Universal’s Def Jam, Warner Music and indies like Matador and Domino have built apps for Spotify. But Spotify should extend its APIs beyond its own application and become a streaming music and discovery provider for other companies’ sites and apps. That way, it would gain distribution and potential partner lock-in, both of which would maximize network effects toward a winner-take all outcome. Meanwhile, MOG appears to be an acquisition target for the hot headphones manufacturer Beats Electronics. Beats, in turn, is majority owned by the big mobile phone handset maker HTC. HTC could be trying to put together a device-based, closed-loop system that could create a subsidized music service, another GigaOM Pro Disruption Vector. Although Nokia tried something similar and its program flopped, Deezer and Muve have had some success screening the cost of on-demand streaming by bundling it with voice and data services via carriers. But those efforts are carrier-driven rather than tied to hardware, which already has razor-thin margins for anyone but Apple. It’s clear that, like all digital media, digital music services need to cultivate multiple revenue sources to thrive. That includes consumer fees, advertising and, perhaps, licensing. Both Spotify and MOG sell ads, but mostly to help subsidize free trials they hope to convert to paying customers. And that’s even though MOG has an ad network to sell inventory on other music sites. Audio ads are still a tough market, but video and display ads on apps might gain new momentum from tablets. MOG has a iPad app; Spotify does not. Fees from consumers look attractive, but they’re hard to come by. Spotify doesn’t break out its numbers, though it has said it has 3 million paying subscribers worldwide. That would represent a phenomenally high conversion rate for digital content. GigaOM Pro’s Q1 consumer survey shows that only single digit percentages of music streamers (6 percent) have paid for a music service, although four times as many (25 percent) had bought a music download in the last three months. There are strong hints of music listening substitution. Music streamers (27 percent of the U.S. online adult population) listen to local radio stations and CDs at the same rate as the rest of the population. But the subset of streamers whose primary listening mode is streaming (8 percent of online adults) are lighter radio and CD listeners. Both groups are above-average users of music on their mobile phones. The digital transition appears to be underway, but it’s likely to be a long slog. Players need multiple revenue streams and some means of staying power, whether that’s a sugar daddy parent company or tons of cash in the bank. Spotify has momentum, but I’d be wary of overestimating its odds to be the sole survivor in streaming music. How do you think music streaming will make money? A key objective of online social media marketing is to reach influential consumers and get them to pass the word. But marketers and advertisers have to find those influencers first. Do consumer technology influencers gather on Facebook? Are the fashionistas all on Pinterest? Consumer electronics and technology influencers, the biggest category, shows the highest overlap. 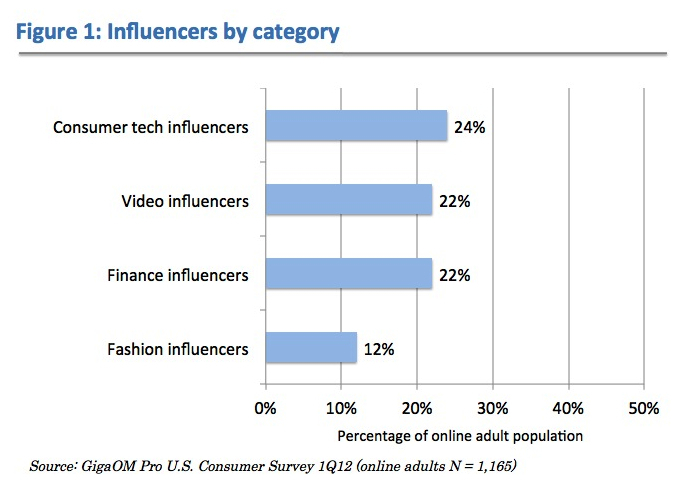 Over half of consumer tech influencers also influence friends in all of the other categories, even fashion. Don’t stereotype fashion influencers as female; 46 percent are male (60 percent of tech influencers are male). Clever marketers should combine themes in ad campaigns or offers. Entertainment combined with a mobile phone or PC is obvious, but what about fashion or finance? 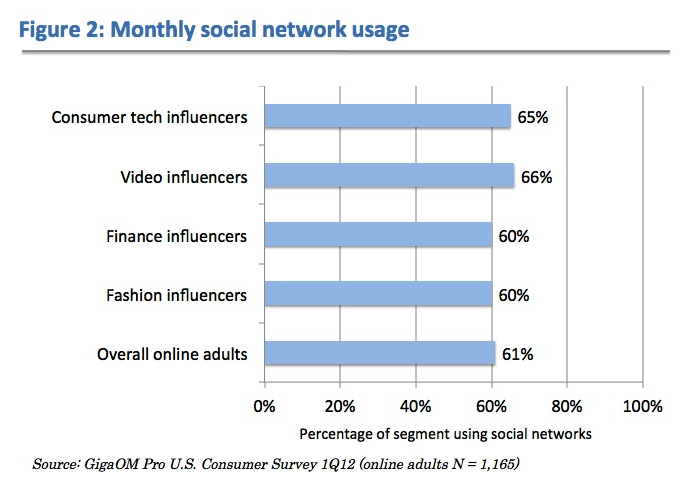 As shown in Figure 2, social network usage is a mainstream phenomenon, and the influencers aren’t much different from the mainstream. 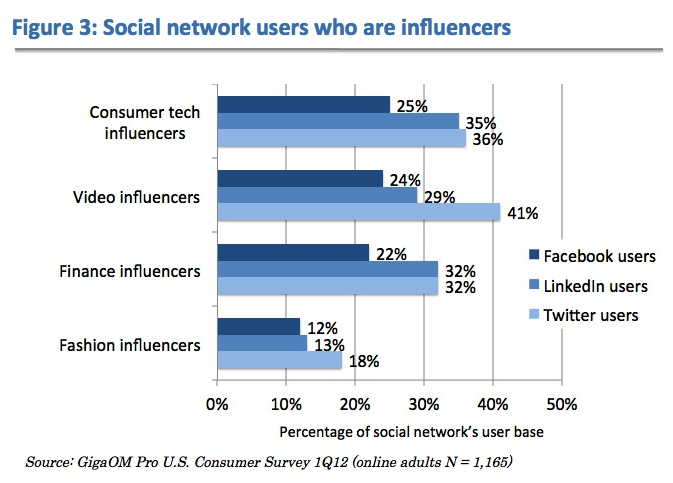 Nearly two-thirds of video influencers are regular users of social networks, so they are a tiny bit more concentrated. That’s not too surprising, as they are a shade younger than the average online adult. Perhaps surprisingly, the youngest group of influential adults, the fashion influencers, are only average users of social networks. So which social networks do influencers use? The same ones as everyone else. Ninety-four percent of regular social market users use Facebook, according to our survey. That figure only varies by a few percentage points for each category of influencers. Since Facebook has by far the most users of any social network, marketers will find lots of influencers there. But at the same time, over half of the influencers that use social networks use more than one, and over 20 percent of each category use three or more. Our survey shows Facebook doesn’t always deliver the highest concentration of influencers. Marketers may be able to get a better bang for their advertising buck with campaigns or programs that use Twitter, as shown in Figure 3. Across the board, more Twitter users are influencers compared to other social networks. LinkedIn has a similar concentration of finance influencers among its membership. What about the newest hot brand in social media, the social scrapbook Pinterest? Well, Pinterest still has a relatively small membership base of 10 to 15 million users, though those users spend time there like on no other network than Facebook. Our survey got a statistically insignificant number of respondents who use Pinterest. Examining the survey results for directional indicators, you will find that Pinterest appears to attract more than its share of early adopters and people who want to be in the know about new products. But while Pinterest attracts an above-average concentration of video influencers, it actually looks below average for fashion. Marketers must probe deeper than what might be conventional wisdom. We encourage GigaOM Pro clients to ask us to dig into our consumer survey results. Meanwhile, keep an eye out for our coming survey-based analysis on social TV, e-books, social commerce, cord cutting and other topics. What else would you like to know about consumer influencers? After attracting attention last summer for social commerce initiatives with Foursquare and Facebook, last week American Express announced a new coupons hook-up with Twitter. While Amex can bring valuable assets and much-needed experience in loyalty programs to the sector, its efforts are scattered and haven’t gained much traction to date. In other words, it has the potential to be a powerhouse in social commerce, but so far that potential remains unrealized. Closed loop. Unlike other credit card companies like Visa and MasterCard, Amex is both the card issuer and payment system. That means it can identify purchase patterns across different products and merchants by analyzing data from its almost 90 million cardholders. Then it can use that analysis to help its merchants plan, create and target offers to different customer segments. Merchant relationships. It has established marketing relationships with thousands of small businesses as well as big brands that market both globally and locally. Amex offers a rich collection of marketing services, including help with digital advertising and search for small businesses. Loyalty program. Daily deals needs to move beyond new customer acquisition — what most merchants use Groupon for — into retention and loyalty. Amex has deep experience in this space via its Membership Rewards program. While startups like Swipely and ChoozOn let consumers manage and connect multiple loyalty programs, they usually have to work with big brands’ affiliate programs rather than directly. As Colin Gibbs points out, American Express commands consumer trust that other potential social commerce players like Facebook and Google risk losing via media hype over privacy gaffes. Amex is also a contender in NFC-powered digital wallets, but NFC is a long-term play more likely to be driven immediately by ads and loyalty programs than wallets. If Amex emphasizes the former over the wallet angle, it might be able to add wallet functions to social commerce apps within 24 months. Amex’s “Link, Like, Love” Facebook app draws on social graph data like friend connections and check-ins and on user preferences via Likes. And the app has presented attractive deals from big brands like Whole Foods Market, Dunkin’ Donuts and Sheraton. But after an initial rush, it doesn’t seem to have caught on. As I write this, the app has fewer than 37,000 fans on Facebook, and market tracker Inside Facebook shows static usage with fewer than 1,000 daily users recently. This could be a promotion and discovery problem: Apps need a critical mass of adoption before viral promotion can carry the load, especially as Facebook gets more cluttered. The new Twitter effort has some implementation quirks that make me think it will have a hard time gaining user adoption too. While it has viral promotion built in (users tweet a hashtag to their followers to qualify for the offer), offer discovery may be pretty random, lost amid Twitter’s 600 tweets per second. Would-be coupon redeemers may or may not see the offer in their ever-moving feed and have to visit an American Express Twitter page to see what’s available. It’s not like they are getting a daily email or a personally targeted or geotargeted message. These coupons don’t require a purchase or expire instantly, but there is no place for a user to store them where they will be reminded they actually have them. The refund isn’t instant or acknowledged at purchase: It just shows up in the credit card statement some time later, perhaps as long as months later. I have worked with American Express as an analyst, and like many big companies it has multiple business units that sometimes don’t seem to know what the others are doing. Amex’s social commerce initiatives feel pretty scattered, without a single driving focus point. Some of that isn’t the company’s fault. Although small businesses may be gaining digital marketing sophistication, they are not going to be able to use potentially powerful Amex data for preference analysis and personalization anytime soon. That’s an analysis service best suited to big merchants that target locally — the Facebook and Foursquare advertisers rather than the small business-focused Twitter self-serve products. Perhaps American Express’ ultimate social commerce role is as a kingmaker rather than a king, a behind-the-scenes supplier of infrastructure services rather than a consumer-facing source of daily deals and flash sales offers. There would be no shame in that. GreyLock Partners’ Reid Hoffman thinks credit cards could be compelling app platforms because they connect the physical world with the digital. Even Facebook has gone back and forth on Offers and check-in deals: Its latest API enhancement for location services is aimed at third-party apps rather than its own Offers product. Amex would be in good company. Will American Express emerge as a social commerce powerhouse? When Facebook filed for its IPO last month, I wrote that if it hoped to maintain its revenue growth it needed to adjust its advertising strategy to suit big ad buyers. I predicted it needed to change the way it sold ad inventory and add some glitzier formats. Last week, at its fMC event for marketers, it made some progress toward addressing those needs. Competitors and other players in the online advertising ecosystem should note what Facebook is doing right and where it still has holes. Guaranteed reach. Previously, Facebook enabled advertisers to buy a guaranteed number of impressions, but its previewed Reach Generator service means Facebook will guarantee a marketer’s posts will be shown to 75 percent of the brand’s fans within a given month. There is no word on pricing, and this approach is hardly the daypart timing advertisers are used to on TV or online portals. Facebook should add some finer-grained controls or prepackaged slots to support timed releases. And it should build in frequency capping so these ads don’t risk overexposure. Premium placement. Facebook display ads show up in a tiny, right-rail ghetto. And Sponsored Stories, while they are working their way into Facebook’s news feed, are strictly controlled by Facebook’s ranking algorithm rather than by advertiser needs. Facebook still won’t let advertisers do page takeovers or interstitials, but it introduced a new format that will show at log out. This will be a popular slot for brand advertisers, either for targeted audiences or full-day exclusive takeovers to reach everyone. Flashier formats. That log-out ad supports video and rich media. Finally, Facebook can pitch an ad unit that is at least somewhat comparable to what portals like AOL and Yahoo and big online publishers like Forbes, the New York Times and ESPN have been selling for years. Facebook demoed an ad for the 3-D release of Titanic that was slick, but it can’t touch the effect of a day-before-opening-weekend Yahoo home page placement. If that spot commands a quarter of a million dollar price tag from Yahoo, think what Facebook could charge for an exclusive home page or photo interstitial. At fMC, Facebook also announced that Sponsored Stories would work their way into the news feeds on mobile phones. While that is a step toward mobile monetization — a lack Facebook called out in its prospectus — it’s a small step. Like Twitter’s just-announced in-stream mobile ads, Facebook isn’t targeting by location, and it’s not even clear you can buy mobile separate from the desktop feed. Facebook also reintroduced Offers, a coupon-sharing scheme; it had shuttered a prior experiment. And company pages will now use the Timeline format. That is getting mixed reactions from marketers, but I suppose as long as Facebook doesn’t explicitly charge for pages it can be pretty arbitrary in how it makes changes to them. Meanwhile, Facebook made some minor but much-needed improvements to its page management and analytics tools. In my earlier post, I was skeptical that Facebook would make the changes in how and what it sells to advertisers quickly enough, and it would miss out on near-term revenue growth and market share gains. These new initiatives indicate that Facebook, while still focused on reinventing marketing with social techniques where it has competitive advantage, also has its eye on the here and now. It’s not completely ignoring conservative ad buyers. Facebook won’t grow its ad revenue 69 percent in 2012 the way it did last year, but it could double the 24 percent rate projected for the U.S. online display ad market. That means it will gain share at the expense of companies like Yahoo, AOL and MSN. How about Google? Well, that would take an ad network that leverages Facebook’s social graph on third-party sites. Facebook hasn’t changed its story that is has no immediate plans for such a thing. We’ll see. How fast will Facebook ad revenues grow this year?